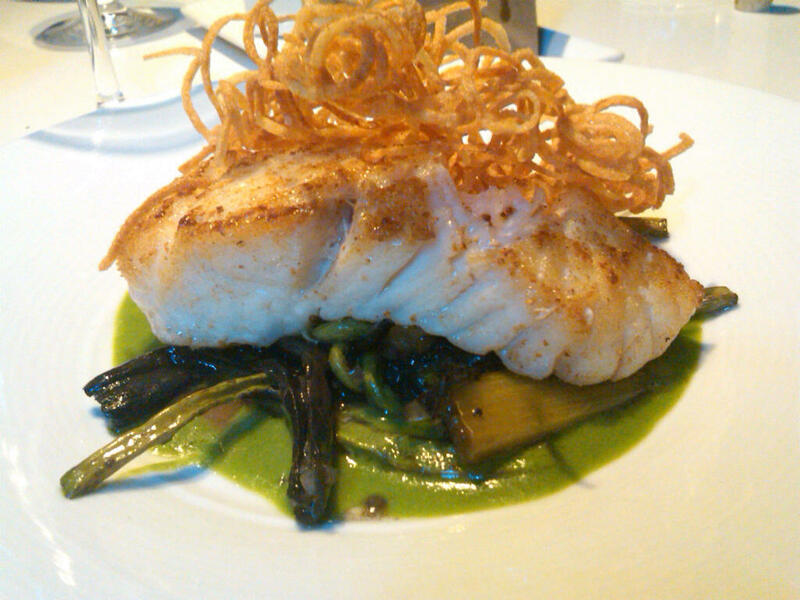 Pan roasted halibut, fiddlehead ferns, black trumpet mushrooms. A dank spring Friday in Portland. The rain-flogged daffodils cower. It’s the kind of evening that begs for a cocktail and comfort food to properly usher in the weekend. Big bro James suggested dinner at 50 Plates in the Pearl after having met one of the owners through work. The hunt for a parking space frayed nerves a bit, but it was nothing a vodka martini couldn’t smooth over. The vibe of this spacious corner place combines clubby (sleek wood-paneling, high bar tables and textured white quartz wall tiles) with old-school diner (comfy booths and banquettes, smooth-top white dining tables). The menu features a cross-section of comforting American traditions. Our first bite was a petite California date stuffed with Vermont cheddar, wrapped in bacon. Sweet, salty, not too crisp — we could have eaten a bucketful. Next was a half dozen oysters spiked with beer, a drop of hot sauce, lime and cilantro. Hola, mis pequeños amigos. After little bites, we moved on to small plates. The four of us shared two chopped Cobb-esque salads from the specials list: addictive with bay shrimp, avocado, cherry tomatoes, egg, croutons and a crunchy mix of lettuces tossed with buttermilk blue cheese, lemon anchovy dressing. 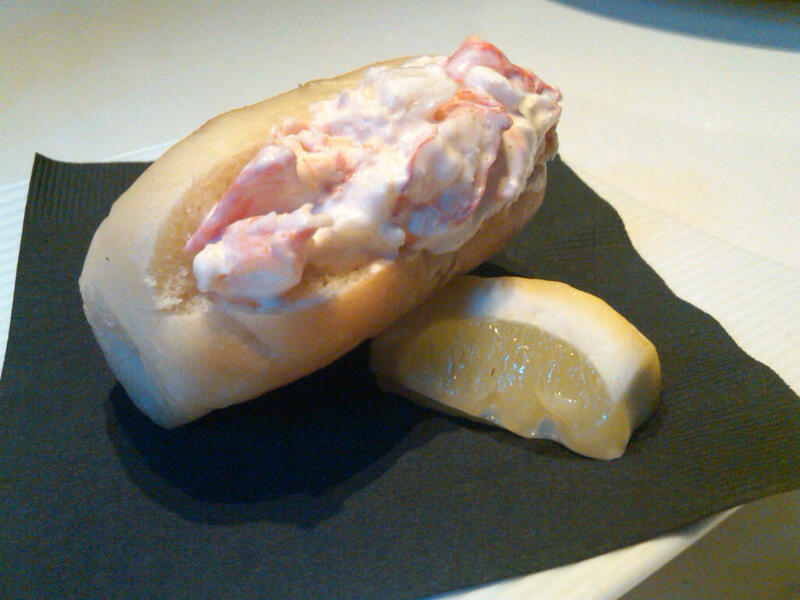 Zandra opted for the Knuckle Sandwich, a buttery mini lobster roll. She reported it as tasty, her only gripe being that the bread overwhelmed the lobster. James ordered, and we all dipped into, a steaming bowl of pan-roasted mussels in a verdant broth of IPA, green tomatoes and chile paste. For entrees, James, Zandra and I were unable resist the much-hyped pan-roasted halibut atop fiddlehead ferns, black trumpet mushrooms and an herb butter sauce. 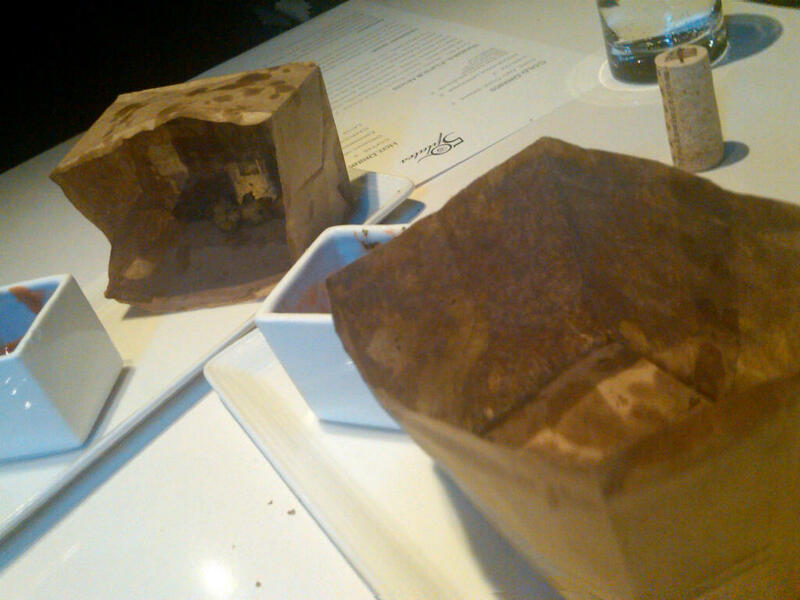 The rich flavors and textures bolstered the raves from our server, and we were converts. And when she declared that 50 Plates is known for its burger … well, you can guess what J ordered. A perfectly juicy Cascade Natural patty dressed up with Amish gorgonzola and thick cut bacon. “Best burger I’ve had in Portland so far,” he said. High praise, indeed. 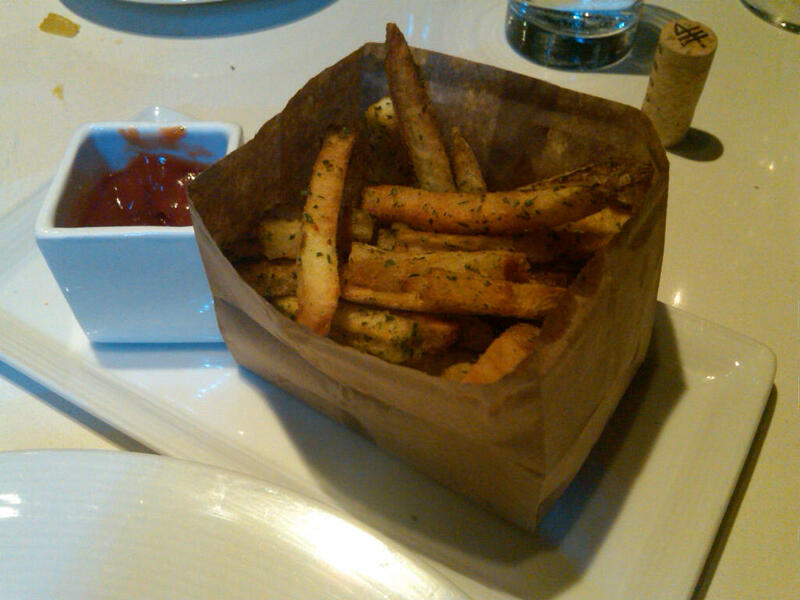 On the side, perfectly crisp hand-cut frites (twice fried in beef fat, no less) from the snacks menu. We polished off one serving and ordered another. God bless America. We briefly considered splitting another burger for dessert, but level heads prevailed. James and Zandra went for the recommended key lime tart, a smooth-textured beauty topped with plump fresh berries and raspberry sauce. J and I ordered the cheese board — a trio of teleme, ale washed aged goat and that haunting Amish gorgonzola, complemented nicely with a drizzle of unfiltered local honey, fruit mince and crackers. 50 Plates: You transformed a gray, drizzly day into a mini road trip across America. Top down, wind in our hair, refreshed. We will see you again soon. 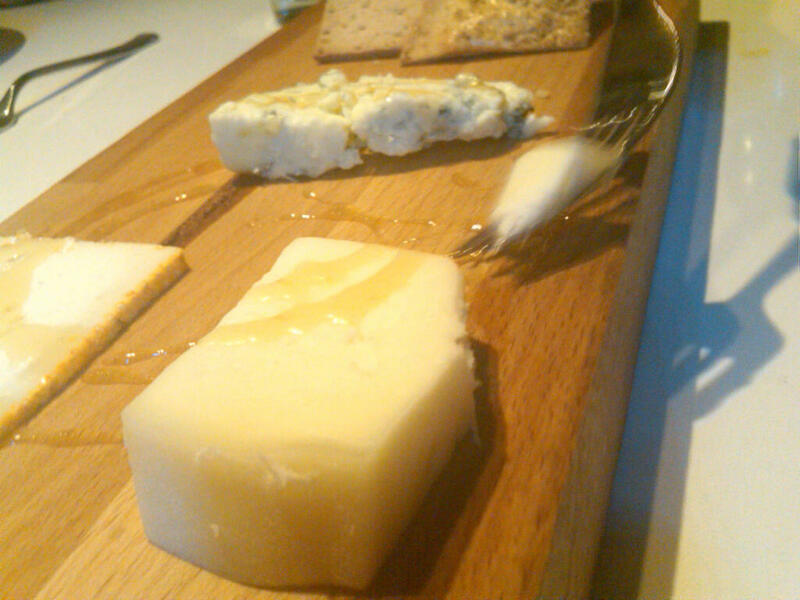 A trio of delectable cheeses. i’m in for the mini cobb salads, burger, cheese plate, lobster roll, oysters… crap, I’m in for it all! so, do they have 50 plates on the menu? or do they only own 50 plates? hoping it’s the first. can’t wait to dine with you in portland! Yes, we shall consume all. I counted around 30ish plates on the menu, not counting the desserts, flips and nogs. But I think the name might come from their drawing on the food from across the U.S. It was a delicious surprise. When are you coming? !